Ronald McDonald House at Stanford is one of 24 Ronald McDonald House Charities locations that offer Digging Deep to many of their visiting patients and families. This month we’d like to highlight the life changing work that they do, since RMH Stanford is right in our own “back yard.” Most people have heard about Ronald McDonald House Charities, but you may not realize how many amazing things happen within their cheerful walls, or even across the globe. Scholarships for students across the U.S.
Their mission is to create and support programs that improve the health and well being of children. Their core belief, and we feel what has made their organization so successful, is that when you change a child’s life, you change a whole family’s life, which can change a community, and ultimately, the world. Pioneers in providing family-centered care, they strive to provide programs that strengthen families during difficult times. Many, many families are displaced during a child’s long-term illness—they may have to travel hundreds of miles for treatment that lasts weeks, months and sometimes even more than a year. Ronald McDonald Houses offer a home away from home, infinitely cozier than a hotel and very affordable, or free if need be. They provide food, lodging and programs to help families bear their burdens financially and emotionally, especially for underserved and rural communities who have to travel far for hospital care. According to Annette Eros, CEO at RMH Stanford, in 2014, Global RMHC launched a three-year “RMHC Impact strategy” with the goal of serving one million more children and families per year. That is a tall order to fill, but RMH Stanford has played a significant role in carrying out one of the global organization’s top priorities—expanding the entire company’s reach by creating new programs and growing existing ones. 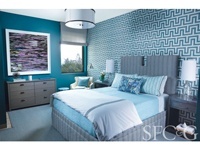 Stanford has just completed a beautiful, 52,000 square foot expansion, with 67 new family suites. After upcoming renovations to the original House that will add an additional nine bedrooms (for a total of 123 guest rooms), theirs will become one of the largest Ronald McDonald Housed worldwide. The new expansion features multiple, stunning common areas like teens’ and children’s activity rooms, a media center, computer room, fitness center and others. Families are treated to the “Meals for Munchkins” program, where volunteers come in on a regular basis to cook lunch and dinner for all. (Breakfast is continental since most families are in a hurry to get to the hospital in the morning.) “Fun Clubs” offer all sorts of activities for patients, their siblings and parents, helping to take their minds off their illness and treatments for a while each day. “Family Rooms” are the fastest growing RMHC program (206 to date), built directly in hospitals, and often in ones that don’t have neighboring Ronald McDonald Houses. These rooms have all you can imagine: comfy sofas and chairs, big screen TVs, small kitchens, allowing families waiting at the hospital to relax in a cozy, home-like room—much more comforting than a typical hospital waiting room. Ms. Eros feels the best thing about Ronald McDonald House is the sense of community among families staying there. The knowledge that they are not alone, coping with their child’s illness, but are living, eating, socializing and sharing with other families facing similar ordeals, is truly priceless. Despite what patients and families are going through, it’s a very happy place, with kids running around laughing, playing, up to mischief, as they would at home. Parents bond with other parents. Siblings have a chance to have some fun of their own. You can’t take away the difficult realities of illness and lengthy treatments these families face, but you can add a little normalcy to their lives by providing a roof over their heads, some good meals, camaraderie, and emotional support. Annette recounts that recently, a family that was returning to Ronald McDonald House several months after their original stay, bounded through the front door. Within earshot, Annette overheard their little boy shout out ecstatically, “We’re home!” For Annette, that sums up everything wonderful about Ronald McDonald House. It does feel like home, and families are happy to be there. For information on how you or your organization can help Ronald McDonald House Stanford, including preparing Meals for Munchkins (with your group of neighbors, co-workers, church-members or extended family), monetary donations, or donating items to their Wish List, please refer to Ronald McDonald House Stanford’s website. 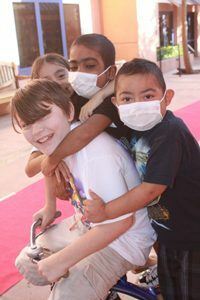 Photos are courtesy of Ronald McDonald House Stanford. Jennifer is a marketing and marketing communications consultant for Resonance House and the Digging Deep project, responsible for Partner Relations with hospitals and nonprofits. She holds bachelors degrees in History and French Studies from Stanford University and worked in marketing communications and public relations for start-up companies including SuperMac Technology and ASP Computer Products. She also worked as a French tutor and substitute teacher while raising her three children. Her work getting Digging Deep to thousands of children with serious illness holds a special place in her heart, with a sister who suffered many complications from Type 1 Diabetes and later succumbed to cancer.